When I put my skin first, my makeup assemblage becomes light and tightly edited. I make a heavy emphasis on good skincare for a clean canvas so that makeup doesn't become my artificial veil of confidence, as it once was throughout my younger years. 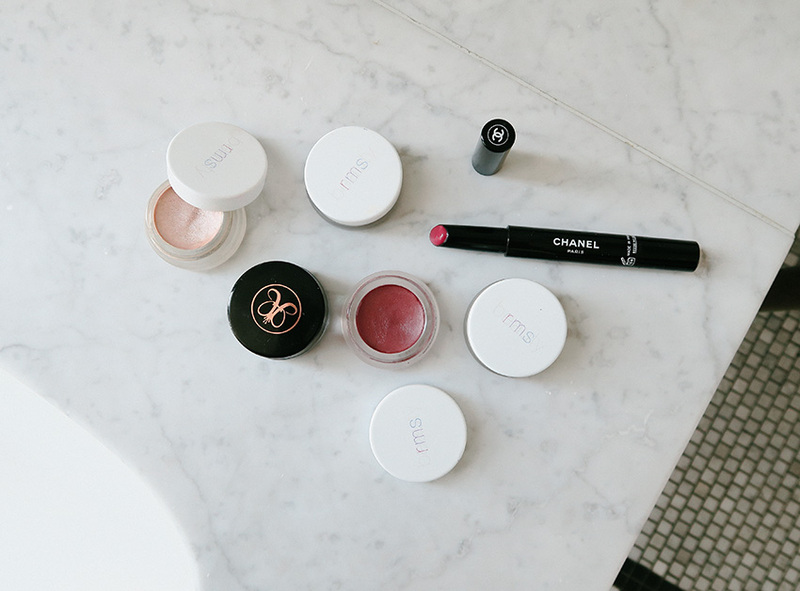 I stick to my five hero products that I use every single morning for a natural, glowing day look. For my sensitive palette, natural beauty brands are my go-to and I never feel bad or heavy for wearing layers of makeup if it has good ingredients. RMS Beauty is a pure approach to a radiant look, using natural, certified organic ingredients like coconut oil and argan oil that interact and support your skin as you wear it. I swear it helps any blemish I have go away faster when I conceal with RMS Un Cover-Up. I dab the Lip2Cheek in Illusive on the apples of my cheeks and a swipe of RMS Eye Polish in Lunar on the cheekbones, nose bridge, and inner corner of my eyes (I rarely use it as actual eyeshadow because it's too creamy for my oily eyelids). I never leave the house without a bit of Dipbrow. Lastly, Chanel's Rouge Coco Stylo is a rare lip product that combines subtle radiance and a natural tint that can leave a just-bitten stain or layer for more of a dramatic lip. I've heard such great things about that Dipbrow! I have their Brow Wiz and am obsessed with it!